The Gill WindMaster HS provides all of the advantages of the scientific grade HS measurement head design with the ease and feature set from the Gill WindMaster range. 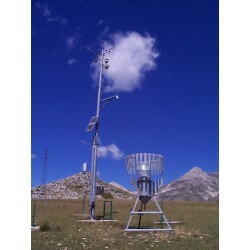 The horizontal head design allows for highly accurate vertical flow analysis with minimal interruption from the anemometer geometry. U, V, W vector components, sonic temperature and speed of sound outputs are available as standard. The WM HS has a stainless steel external construction.